Your waistline will be increasing and your body shape changing but your belly is unlikely to be very prominent for several weeks. 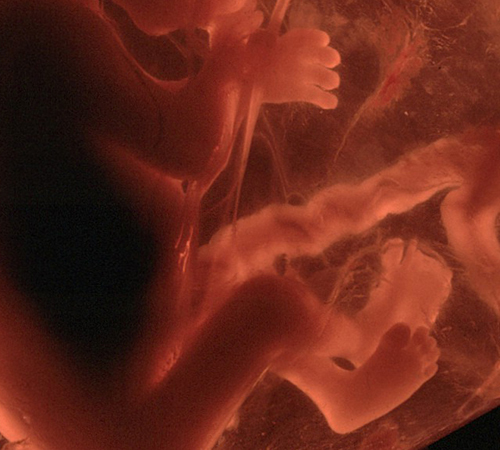 It is surprising how much detail is already present in your baby’s body. 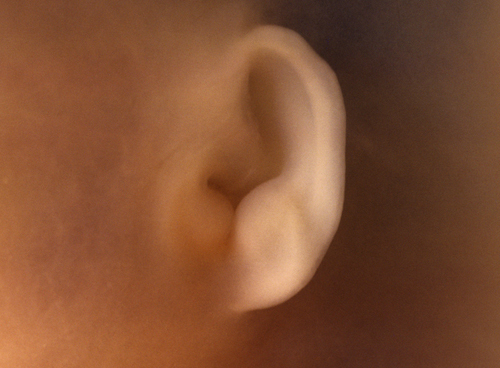 This closeup of an ear shows that its helical pattern of folds is nearly fully developed, although it is still too soon for your baby to hear anything. By week 14, if you stand in your underwear in front of the mirror, you will see a change in your body shape, but to the outside world you may not look very different. Women who have previously been pregnant tend to show earlier than those who are pregnant for the first time, because their stomach muscles have already been stretched once and so stretch much more quickly. Women often say that this is the time when they look as though they have put on weight and feel fat, not pregnant! But it won’t be long before your belly will be visible for the world to see. If you’re feeling uncomfortable and heavy, make sure you choose the right clothes. See the section Become a clothes cheat! for some tips on how to adapt your wardrobe without having to spend any money yet. Heartburn Lying down soon after a big meal can cause acid reflux, known as heartburn, which can make it uncomfortable for you to sleep. To lessen the possibility of disrupted sleep due to heartburn, avoid eating big meals 2–3 hours before bed. If your heartburn is severe, discuss over-the-counter medication options with your doctor. Restless leg syndrome This condition, which makes you feel the need to move your legs around to relieve a creepy-crawly feeling while you’re lying in bed, is fairly common in pregnancy. It’s a good idea to mention it to your doctor, since it can sometimes be caused by a deficiency (like anemia) that can be treated by taking supplements. Napping If pregnancy makes you tired, you may want to grab 40 winks in the afternoon. But for some pregnant women, this extra shut-eye makes it more difficult to fall asleep at night. If this happens to you, skip the afternoon nap and go to bed at night a little earlier than you usually do. Q: Is it safe to use complementary therapies? Reflexology is a complementary therapy that involves applying pressure to reflexes on the hands and feet. It’s believed to help with morning sickness, backaches, fluid retention, and swelling during pregnancy. Your baby’s central nervous system, including the brain and the spine, now has all its basic components. The core development of your baby’s central nervous system has taken place, and it will now progress further using four overlapping processes. The number of nerve cells increases and their positions alter during migration—a process by which cells move to their final locations and develop specific functions. The connections between individual nerve cells become more organized, and the fibers become insulated. The growth of the nervous system now enters its most active phase. Reflecting this, the head accounts for half of the entire length of the baby. Both the nerves and their supporting cells increase in number. Although most of the nerve cells are produced during pregnancy, the supporting cells continue to increase in number during your baby’s first year. The supporting cells assist in the migration process, which is largely completed by 22 weeks. Q: Can I continue jogging? A: There’s no reason why not if you were a regular runner before you became pregnant, but take it easy—now is not the time to run a marathon! You need to avoid becoming overheated so don’t run on hot days and drink plenty of water, regardless of the temperature. Wear a good sports bra to support your growing breasts. Whenever you can, run on soft surfaces, such as grass, to reduce the stress on your joints, especially your knees. Jogging is a good aerobic activity during pregnancy in the early months, but is only advised if you’re used to jogging. Don’t take it up as a new activity in pregnancy. Pork is an excellent source of protein, vitamin B6, and zinc—which are all essential nutrients for pregnancy. Pork has a reputation as a fatty meat, but this is not deserved; it is probably due to the fact that some cuts can be fatty, such as spare ribs, bacon, and ham, but many cuts of pork have less saturated fat than beef. The key to eating healthily is to look for the leanest cuts. These usually have the word “loin” in the name, such as tenderloin or top loin chop. A serving of pork should be approximately 3 oz (85 g). Pork is healthy and delicious, and quick and easy to prepare. Sprinkle some salt on lean pork chops, grill, and serve with some apple sauce on the side; your craving for something both salty and sweet can be met in a healthy way. Always make sure that the pork is prepared on a separate cutting board than other foods and thoroughly cooked to reduce your chances of getting a food-borne illness .